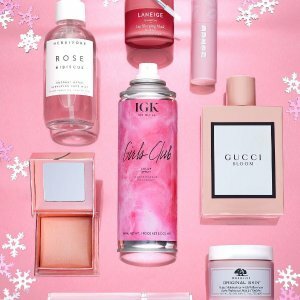 Sephora.com offers Beauty Insider Rewards Bazaar + up to 20% off Beauty Insider Holiday Bonus Event. 20% Off for VIBR & VIB members via coupon code ENJOY . 15% OFF for Beauty Insider members via coupon code BIBONUS . Choose 2 samples with any purchase. How to become a VIB Rouge? VIB Rouge status is conferred on those registered Beauty Insider members who spend a minimum of $1,000 on merchandise (excludes the purchase of e-gift cards, gift cards, taxes and/or shipping) online, in U.S. and Canadian stores, and in Sephora inside JCPenney stores during one calendar year (January-December). How to become a VIB? VIB status is conferred on those registered Beauty Insider members who spend a minimum of $350 on merchandise (excludes the purchase of e-gift cards, gift cards, taxes and/or shipping) online, in U.S. and Canadian stores, and in Sephora inside JCPenney stores during one calendar year (January-December). *20% offer valid for Rouge members on merchandise purchases made from 10/26/18 through 10/29/18 at 11:59pm PT and from 11/2/18 through 11/5/18 at 11:59pm PT in Sephora U.S. stores, Sephora Canada stores, Sephora inside JCPenney stores, and online. Offer valid on merchandise purchases in Sephora U.S. stores, Sephora Canada stores, Sephora inside JCPenney stores, and online. Offer not valid on jcp.com. Not valid on purchases of customizable sets online or through Sephora’s Customer Service. Not valid on Google products. Not valid on previous purchases, purchases of gift cards or eGift cards, FLASH, PLAY! by Sephora, gift wrap, taxes, or shipping & handling charges. Clients are limited to the purchase of one Dyson item, three Drunk Elephant items, and three Tatcha items per SKU per transaction. Return of discounted merchandise will be for the price actually paid. Sephora is not responsible for damaged, lost, or stolen promotion cards. Promotion card has no cash value and may not be altered, sold, or transferred. Relevant Beauty Insider status must be attained prior to redemption. No minimum purchase required. Due to heavy demand, Sephora FLASH delivery times cannot be guaranteed for this promotion. Not valid on orders shipping outside the U.S. or Canada. Cannot be used in conjunction with other promotion codes or Rouge Reward. Sephora and JCPenney employees are not eligible for this offer. Offer is subject to change, alteration, or termination by Sephora at its sole discretion at any time. If you recently qualified for a new tier, please check your email for an updated offer.